Starting their own business was somewhat of a necessity for Al and Karen Allstadt. In the early 1970's, feeling that their Bloomington teaching jobs were on somewhat tenuous ground, they struck out on their own. Karen's father, who sold new Kirby vacuum cleaners door to door, had a large stock of used machines he'd received as trade-ins. 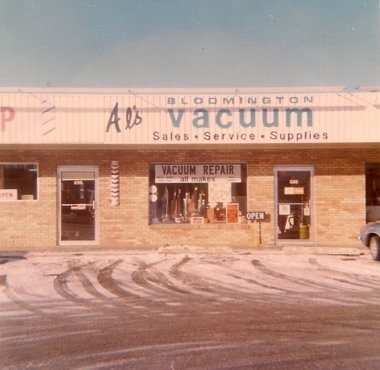 So, with $500 and that load of vacuums needing reconditioning and repair, Al and Karen started a small vacuum repair shop. Since their 1973 beginning, Al and Karen's 500 sq. ft. repair shop has grown into a spacious retail and service supercenter, building its reputation as the Upper Midwest's leading professional floor care provider along the way. It hasn't always been easy, however. Al and Karen credit their success to progressive thinking—aligning themselves with life-time-value companies like Riccar and Miele for example, hard work, General Manager Dave Rempher and their loyal customer and community supporters. The company's mission of “doing whatever it takes to best serve the customer” isn't just a philosophy—it's reality!